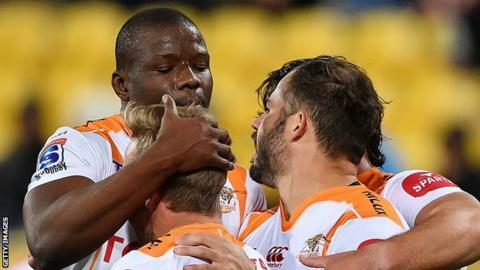 South African teams Cheetahs and Southern Kings are set to join the Pro12 as early as September 2017. The two sides are expected to be cut by South African rugby union authorities from Super Rugby on Friday, 7 July as the southern hemisphere competition is reduced from 18 to 15 teams. That will pave the way for them to join teams from Wales, Ireland, Scotland and Italy in a 14-team league. The new format is set to start for the 2017-18 season. Celtic Rugby Limited - which governs the Pro12 - Cheetahs, Southern Kings and the South African Rugby Union have all been contacted by BBC Wales Sport but declined to comment. Teams will play on a home and away basis but what has yet to be agreed is the format of the competition, whether it will be played as one 14-team league or more likely two conferences of seven. There has been speculation the South African sides could play some of their home matches in the United Kingdom, with Saracens' Allianz Arena mooted as a potential venue. This would be the first major change to the Pro Rugby competition since the introduction of Italian sides in 2010. Welsh and Scottish sides first combined in a league in 1999, before an agreement with the Irish Rugby Football Union saw the Celtic League formed in 2001 with 15 teams. Now the tournament is set for another shake-up with the introduction of Cheetahs, based in Bloemfontein, and Port Elizabeth-based Kings. The Cheetahs had already been approached to join the league. Both are widely expected to lose their Super Rugby status amid a downsizing of the competition from 18 teams to 15. The South African Rugby Union and Sanzaar have indicated the decision will be made and announced on 7 July. South African authorities have called a special meeting for that day to decide which two of its six teams will be dropped from Super Rugby. As well as the two discarded South African sides, Australia will also lose one of its five representatives in the competition which also includes teams from New Zealand, Argentina and Japan. SARU is eager to align with a northern hemisphere tournament, which has a similar time zone, to make cross-border games compatible for television broadcasters. This latest development could also open the door to North American participation for the following 2018-19 season, as the Pro12 explores options for expansion to generate more revenue and tap into new markets. What next for rugby's Pro12? Welsh Rugby Union chairman Gareth Davies insisted nothing had been finalised but welcomed the future prospect of South African sides joining the Pro12 competition. "I can't tell you probably any more than has already been stated," Davies told BBC Wales Sport. "There are discussions going on, which people are aware of, between the Pro12 and South African rugby union and the franchises down there. "There is a desire from the South African teams I think to join the Pro12 and I think the Pro12 would like them to join. "The Pro12 itself is a cross border competition already and this just extends this. "It makes for a promising and exciting future, if it did happen. "At the moment it looks like the two teams from Super Rugby that will not be in the competition next year will join (the Pro12). "I suspect there will be interest further afield from South African teams as well. "It just expands the tournament and I think it's an opportunity to develop the game within the northern hemisphere. "There is still a lot of work to be done in terms of the legal complexities with issues such as broadcasting, commercial and most important, player welfare with all the travelling that has to be done and the logistics associated with that."